I live in a bubble. Holland is a left-leaning progressive nation that mandates universal health care, empowers foreign residents to vote in municipal elections and has long ago recognized gay marriage. The country offers free drug testing if you’re not sure about the pills you’re planning to pop at the next rave. I don’t live in fear of bodily harm, losing my home or falling through the safety net. But lately, I’ve been thinking that no amount of glue can seal all the cracks in my bubble life. In fact, it might be time to leave the bubble altogether and face reality head on. My journey started with a reading I recently organized at a venue created by Syrian refugees. It was my second event at this wonderful place and I wanted to work my social media platforms to generate more publicity. That, of course, meant posting to the general public. One comment from a random visitor suggested that I wasn’t welcome at this venue. Not because I’m a woman or due to the color of my skin, but rather because I write in English. There were plenty of venues in Amsterdam, the comment read, where English speaking poets and writers could perform their work. I should go there. I understand the desire to cherish one’s culture, especially if it’s under siege. And I can imagine the battlefield mentality that kicks into gear when you believe your culture is under attack. But it seemed to me that this comment was a call for apartheid. You have your space and I have mine. Don’t come into my bubble. 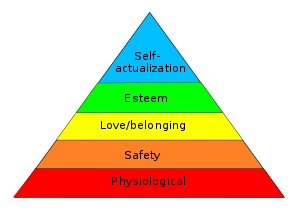 Maslow‘s hierarchy of needs tells us that food, water and shelter are our most basic needs. We cannot begin to grow and learn unless and until we are also safe. This is why we used to build moats and city walls and why there are gated communities in the US. We Americans believe that walls can protect us. We believe that a safe space will save us from the outside world. tantamount to physical violence. Books and lectures that might offend various sensibilities [must] now come with “trigger” warnings. viewpoint diversity, mutual understanding and constructive disagreement. Haidt is alarmed by the culling of conservative voices from American universities and the general lack of space for any dissent. It’s not that Haidt himself is such a conservative. Rather, he believes that an ideological mono-culture is anathema to serious academic research and true learning. Despite [Ceylan’s] illness, which entails extreme anxiety and suicidal tendencies potentially “triggered” by both the external world and the internet, Ceylan finds trigger warnings counterproductive. “I don’t like them because they are triggers in themselves,” she said […] “If you are warned that something you’re about to read or watch is upsetting, you’re already primed to be upset. Oberlin College is a fabled liberal arts college in Ohio. It prides itself on being the first American university to “regularly” admit blacks and women. You’d think such a school would foster interaction of the best kind. The Big Uneasy tells a different story. the students had started seating themselves by race. Those of color had difficulty with anything that white students had to say; they didn’t want to hear it anymore. […] The class was supposed to be a research workshop. But students went cold when they had to engage with anyone outside their community. 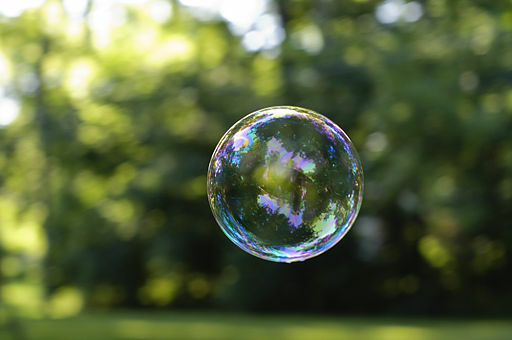 Oberlin students seem to believe that the answer lies in more bubbles: one bubble per subset, maybe even one per person. Inside that bubble, there can be no discord, no fear, just supreme certainty that your thoughts and beliefs are the only correct ones. The problem with living inside your own bubble is that you’ll never learn something new. This concept is diametrically at odds with the very purpose of education. Bret Stephens once wrote editorials for the staunchly conservative Wall Street Journal. In 2017, he decided that he was preaching to the choir and moved instead to the liberal New York Times. I thought it was time to leave my own safe space: to take the gamble that I might be able to sway readers not always inclined to agree with me, and to accept the possibility that they, in turn, might sway me. Try to remember that words are not weapons, and that politics is not warfare, and debate is not a death sport. Learn that — in politics no less than in marriage — it’s a bad idea to go to bed angry with one another. Have an argument, then have a drink, together. Easier said than done. I was angry when I read the comment telling me to hold my reading someplace else. That anger initially fueled the writing of this blog post. Once I wrote it, though, I got scared. Will these words “trigger” more negative reactions? A condition of life outside the bubble is not knowing how the world will respond. It certainly won’t always be applause. The response may be painful, infuriating or utterly indifferent. I may learn that I’ve insulted someone and that is not my intention. But I’ll never know if I don’t get out of my bubble to find out. So: to the person who thought I should move my event, I wish you had been there. 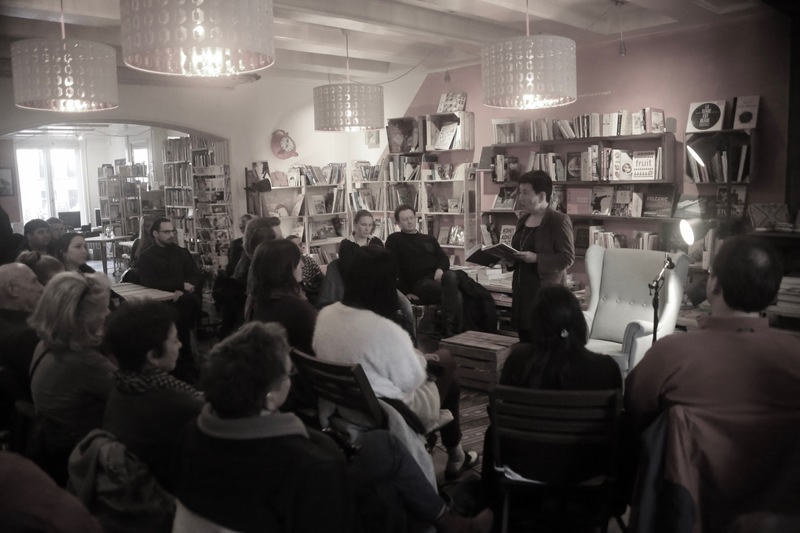 We had established writers and newbies, poets and humorists who spoke to an audience that crossed all categories of age and ethnicity, nationality and language. To Samer al-Kadri and Ghiath Kaddah, thank you for allowing us to be a part of your community. Plans for the next reading are already in the works.